If you are planning your weekend activities, you may wish to work in these presentations by two leading champions of jazz on the air (and the web). Jonathan Pugh grew up in Wenatchee and his first musical memories include standing by his Dad as he led the band at his S ummer youth circus. Later, he connected with Don Lanphere in Wenatchee and studied with him during his teen years. It was mutual inspiration as Jonathan became a regular member of the Lanphere Quintet, touring and recording eight albums with the sax legend during his resurgent career. Jonathan started on trumpet, but today focuses on the mellower cornet. He presently teaches in the Edmonds Schools. Joining him in this Art of Jazz concert from the Seattle Art Museum are Dave Peterson on guitar, Jon Hamar on bass and Max Wood on drums, all notable for their tone and swing. Jazz Northwest airs on Sundays at 2 PM PST and is streamed at kplu.org. …pretty sure this is one that never got recorded or named………….Don would write amazing bebop lines based on chord changes from different record albums………….he might have just called it “black 1-1” (black album cover, side 1, track 1). Clarinetist Pee Wee Russell (1906-1969) spent much of his career playing in Dixieland-style settings. But his highly unorthodox playing defied categorization, and in the 1960s he recorded a series of albums for the Impulse label that showed him at his most unique. Among other things, he performed compositions by Ornette Coleman, John Coltrane, Thelonious Monk and Oliver Nelson. We’ll hear Pee Wee in a quartet with valve trombonist Marshall Brown, bassist Russell George, and drummer Ronnie Bedford; a reunion concert with an old friend, trumpeter Henry “Red” Allen, and a rhythm section of pianist Steve Kuhn, bassist Charlie Haden, and drummer Marty Morell; and a big band arranged and conducted by Oliver Nelson. Kirchner’s Jazz From the Archives airs Sunday at 11 pm EST on WGBO-FM at 88.3 on radios in the Newark/New York area. The program will also be streamed on the web at http://www.wbgo.org/. “Unorthodox,” Bill wrote above in describing Russell’s playing. Oh, yes. With his phrasing, dynamics, tonal manipulation, slurs, slips, slides, silences and surprises, Pee Wee was avant garde decades before the appearance of Ornette Coleman, Anthony Braxton or John Carter. Here he is, playing a B-flat blues in a club performance the year before he died. 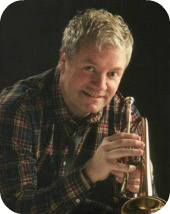 Jimmy McPartland is the trumpeter, with Art Hodes, piano, Rail Wilson, bass, and Harry Hawthorn, drums. Pee Wee has been one of my very favorite players since the first time I heard him, and this live video recording is a lovely time capsule for a great fan who never got a chance to hear him live. This is also the first video I’ve seen of Jimmy McPartland, who also plays great. I think my favorite of the current crop of clarinetists is Don Byron; I’ve always wanted to ask him what he thought of Pee Wee. Sadly, the Lanphere track is awfully hard to listen to, because the very poorly done audio recording does its best to obscure what seems to be some very interesting music.